As kids go back to school this year, more dads will be the ones making the lunches, signing the permission slips and manning the carpool rotation. There are more dads staying at home to take care of the kids, and more dads who want to, according to a new report from the Pew Research Center. Here are five things you didn’t know about this growing demographic. 1. Stay-at-home dads have more than doubled over the last two decades. There are 2 million stay-at-home dads in the U.S., according to the Pew report, which defines SAHDs as “fathers who lived with their children younger than 18 and did not work outside the home.” This number spiked to 2.2 million in the wake of the recession, which left more men than women unemployed. The National At-Home Dads Network points out that the Pew number includes fathers who are simply unemployed and not their family’s primary caregiver, and estimates the number of SAHDs to be lower: 1.75 million. However, that’s still a big jump from the number of stay-at-home dads in 1989, when the number was 1.1 million. Marc Mitchell, 35, began collecting unemployment checks in 2013 after his teaching contract wasn’t renewed by his Florida school district. Determined to remain employed, he applied for more than 50 jobs and went on about 20 interviews. But rather than continue to fund day care for his 3-year-old son and 1-year old twins, Mitchell decided to go off unemployment and stay home full time. Though unemployment initially propelled Michell into the SAHD role, he says he doesn’t feel forced into it like he once did. 2. Many live on low incomes. Nearly half of all stay-at-home fathers (47%) live in poverty, which the U.S. Census Bureau defined as an annual income of $23,283 for a family of four in 2012. To compare, 34% of stay-at-home mothers and only 8% of working fathers live in poverty, according to the Pew report. Mike Andrews Jr., 29, has been a SAHD since 2012, when he quit his $10-an-hour job at a fast-food restaurant because the money wasn’t enough to make day care worth it. His family lived nearly paycheck to paycheck on his wife’s income at their home in Somerset, New Jersey, while Andrews took care of his sons Liam, Jude and Benjamin, now ages 6, 5 and 3. The Andrews family is more financially stable now that Mike has taken a job working the night shift at a UPS store and his wife has gotten a better-paying job. Mike purposefully focused his job search on nighttime jobs so he could be with the kids during the day, and he still considers himself a stay-at-home dad. “It’s really hard when people assume that you’re [a SAHD] because you can’t find a job. For me it was a choice,” Andrews says. Some at-home dads, while doing all right presently, worry about the impact that choice could have on their future finances. Neil Newman, 32, stays at home to take care of his four kids in Allentown, Pennsylvania. He already worries about his lack of retirement funds, and is concerned that he will be too old to start a career if he decides to later in life. 3. The least-educated dads are the most likely to stay home with their kids. The more education a father has, the less likely he is to be a stay-at-home dad. 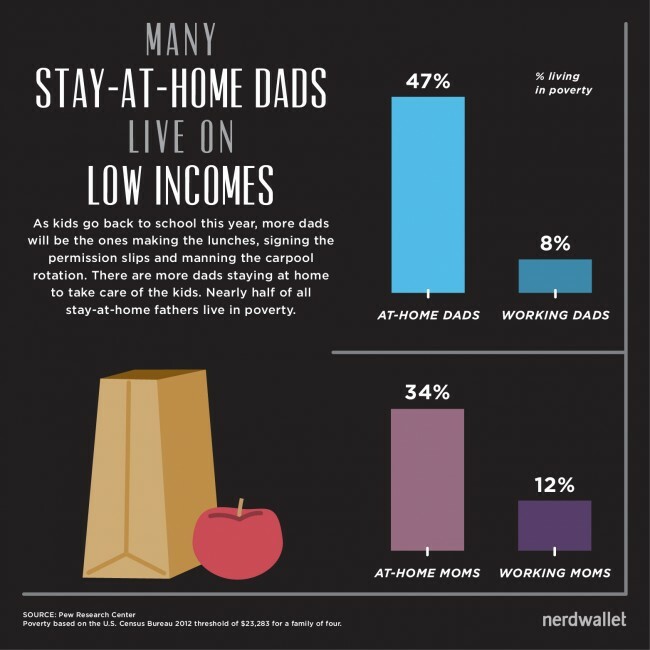 The Pew study found that 14% of dads who have not earned a high school diploma stay at home with the kids, while only 3% of dads with a bachelor’s degree or higher stay at home. This trend mirrors that of stay-at-home mothers, who are also less likely to stay home if they are more educated. Still, many fathers do earn university degrees and choose to stay home to care for their children. Lance Somerfeld, a 41-year-old New York City dad, worked in corporate finance and taught in the public school system before deciding to stay home after his son, Jake, was born. Somerfeld co-founded the City Dads Group to connect with other stay-at-home dads. 4. They are often ill or disabled and generally older. Of all stay-at-home dads, more than a third (35%) are ill or disabled, which could be partly because SAHDs tend to be older than working dads. Although this number is high, it has decreased over time: 56% of SAHDs in 1989 were ill or disabled. Only 24% of at-home dads are younger than 35, while 42% of stay-at-home moms are in that age group. SAHDs are twice as likely as stay-at-home moms to be 45 or older. Ed Pias, 51, is a stay-at-home dad for his 7-year-old daughter and 3-year-old son in Socorro, New Mexico. As an older dad, he says he carries some guilt for not contributing more to the family in a traditional sense. 5. More dads want to stay home to care for their families. Contrary to the popular belief that at-home dads are forced into the role because of unemployment or disability, a fast-growing group of men stays home with the kids because they want to. The Pew report found that of all the reasons dads stay at home, those doing so because of a choice to care for their families showed the most drastic increase, from 5% in 1989 to 12% in 2012. Ian Smithdahl, 37, of Chicago, Illinois, says he had dreamed of being a SAHD since he was a kid himself in the early ’80s. Smithdahl’s childhood dream came true, and after graduating from Tufts University, he eventually became a SAHD to sons Gabe and Sam. As more women enter the workforce, it seems likely that more men will opt to stay at home with the kids. But there are barriers to more fathers being SAHDs. Public opinion is one; a 2013 Pew survey found that more people feel kids are better off with mothers at home (51%) as opposed to fathers at home (8%). Paternity leave is another hot-button issue. A 2014 survey by Boston College found that U.S. fathers take an average of just two weeks off work after the birth or adoption of a child. Despite these barriers, the stay-at-home dad is undeniably becoming a more visible member of society. Dad and baby image via Shutterstock.